India is the abode of rich culture and heritage, and the true reflections of these can be seen in the numerous historic sites, edifices, landscapes and monuments which are spread across the country. One such structural marvel which reflects the true glory of a bygone era are the caves in India. While there are some which exhibit immaculate works of art, others are simply marvellous because of the topography around them, and then there are some which have a religious and cultural string attached. The caves in India narrate the tales about the rich culture, tradition, background, etc. of a bygone era. Most of the caves in the country are now housed and maintained by the Archaeological Survey of India and to access them one might require permissions and registrations. Take a look at the top 10 caves in the country which are ready for one to explore. The rock cut caves of Ajanta and Ellora are found in the Sahyadri mountain range, which was once home to hermits of various religions. While the Ajanta is a group of 29 caves which date back to the 2nd century BC and the 6th century AD these caves are considered to be one amongst the ancient caves in India. The Ellora is a group of 34 caves which date back to the 6th and 11th centuries AD. 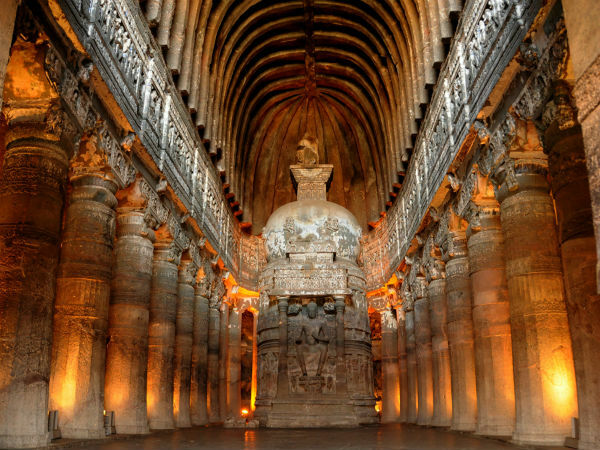 The caves at Ajanta are Buddhist caves, while the Ellora caves are a mixture of Buddhist, Hindu and Jain religions. While the Ajanta caves are rich in paintings and sculptures, the caves at Ellora are known for their exquisite architecture. Amongst the popular caves in the country, these are located at a distance of 7 km from Mumbai. One can find here seven rock cut caves, which have been carved out in detail and date back to the 6th and the 7th centuries. Amongst the seven caves, the Cave No.1 attracts a large number of visitors as it houses beautiful sculptures of Shiva in various forms. The caves at Badami reflect the immense love which the Chalukya rulers had towards architecture. The caves here are one amongst the top tourist destinations in the state of Karnataka. The caves date back to the 6th and 7th centuries AD and are situated at the mouth of a ravine. One can find a total of four caves here, out of which three are Hindu shrines and one houses a Jain temple. The caves at Tabo are carved out from the hill and are believed to have been used for the purpose of meditation by the Buddhist monks. It is also said that the caves were used by the monks during winters as shelters. There are a number of large caves which might have been used as assembly halls and smaller caves which had been used for lodging and dwelling purposes. Many of the caves here are adorned with prayer flags which signify that these caves are still used by the monks for meditation. Located at a short distance from the city of Bhubaneshwar, Khandagiri is a group of 15 caves. The caves here are believed to be the earliest Jain rock cut shelters which were used by the Jain monks during the reign of King Kharavela. The caves provide you a bird's eye view of Bhubaneswar from its summit. The Ananta cave or cave number 3 is most popular amongst the lot which houses carved figures of women, elephants, geese carrying flowers, etc. Udayagiri caves are situated near the city of Vidisha in Madhya Pradesh. Built in the Gupta period, these caves date back to the 4th and the 5th century AD and are amongst the most incredible caves in India. There are about 14 caves in total that consist of many sculptures. The most famous sculpture is the figure of Vishnu in his incarnation as the boar-headed Varaha. There are scores of natural caves in Meghalaya and amongst them Mawsmai caves near the Bangladesh border are amongst the best. They have impressive formations of large passages and chambers; there are also many stalactite and stalagmite formations that add to the beauty of the caves. While at some places, the openings are big and there are a few places where one has to crawl through; the entrances are large and roomy whereas the exits so small that one has to kneel down to come out. This cave marks the early traces of human existence in the Indian sub-continent. The paintings on the wall offer evidences of existence of dance and celebrations and have also been recognized as a World Heritage Site. According to legends it is believed that it was used as a shelter by the Pandavas, who were serving exile and as is evident, the name Bhimbetka was given to the place as it refers to ‘the sitting place of Bhim'. Placed inside the complex of Tiruchirapalli Rock Fort, the two cave temples, namely the Lower Cave Temple and the Upper Cave Temple are amongst the most incredible cave temples in India. These caves are said to have been built during the Pallavas; however, one cannot ignore the extensive contribution of the rulers of the Chola dynasty, Nayaks of Madurai and Vijaynagara. These unfinished cave shrines have a temple of Shiva in the east and Vishnu in the west. The lower caves are marked with a unique form of pillars, which are otherwise not seen in other temples in Tamil Nadu. Dungeshwari cave temple is situated about 12 km from Bodhgaya. There are three caves that have Buddhist shrines, where it is believed that Buddha had spent time meditating. Legend has it that when Buddha was practicing self-mortification, he became weak, feeble and started starving and while he was resting under a Banyan tree, a poor village woman named Sujata offered him food. After Buddha accepted the food offered to him he was presented with a divine truth that neither extreme self-indulgence nor self-abasement is the right way to attain enlightenment. It is in fact the middle path that is required to attain nirvana. There are two small shrines that were built to commemorate this significant event. Also, a golden statue of the emaciated form of the Buddha depicting the strict penance is enshrined in one of the cave temples and in the other temple is a large Buddha statue.